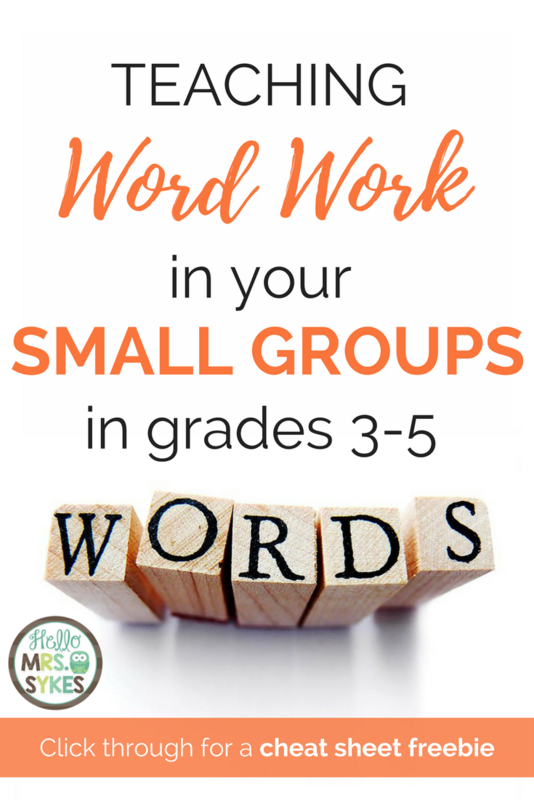 Today, a Work on Words topic that I am extremely passionate about... Small Groups! 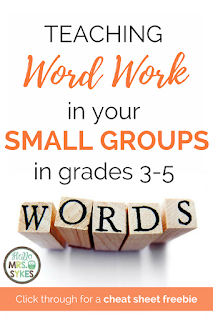 The question I have been asked the most over the years by other teachers is, "How do you find the time to differentiate Word Work for your students and still teach everything else?" 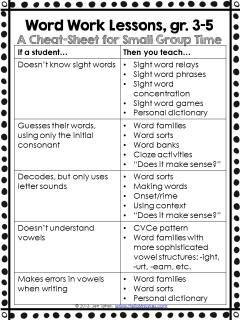 Short answer - I use the time I am already meeting with them in Guided Reading groups. Note: This is how I structure my time with Struggling Readers. In my classroom, fair doesn't mean equal, and I am going to work with students on what they need. 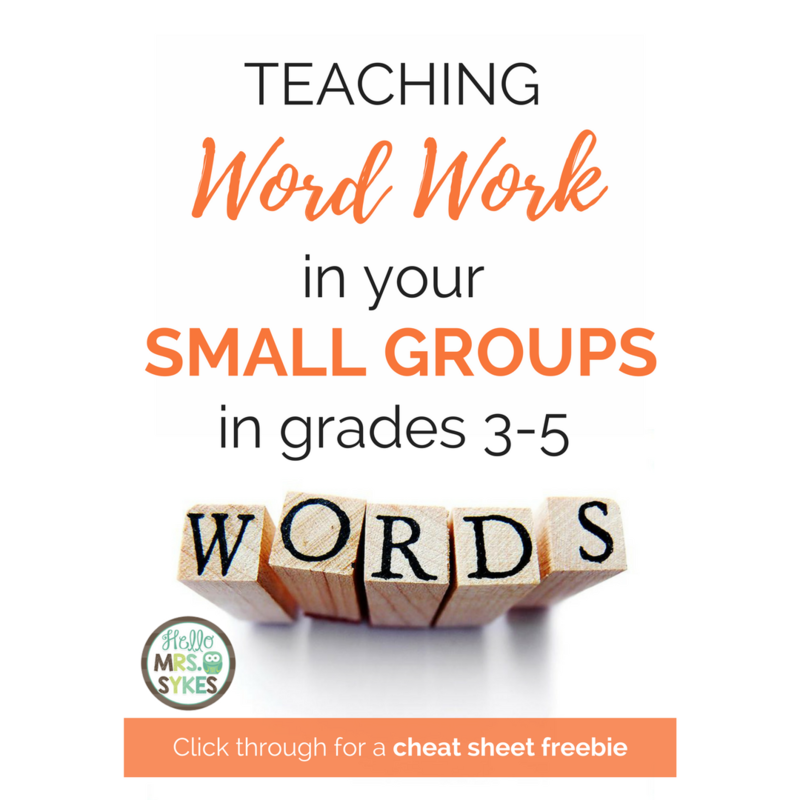 Download a Word Work cheat sheet for free from TPT! If you are looking for sample lesson plans to teach specific concepts, check out my Grades 3-5 Phonics Intervention Packs. On a personal note: I know that this year (2013) is a rough year for teachers throughout the United States. Teacher pay is down, morale is low, and you are consistently being told how to best do your job by people who haven't set foot in a classroom in at least 5 years. High-stakes testing is taking over the schools, and the impact is being felt even in Kindergarten and First grade classrooms. Please know that I understand, and I hope you are able to keep your classroom environment positive for both you and your students. Seek out help if you need it, and continue to seek help if the first "solution" didn't work. Your profession is truly important, one that every person called to teach should feel proud of. As a teacher, a Literacy specialist, a parent, and a taxpayer, I appreciate the work you do every day. Thank you!! Idioms, Close Reading Guide, and a Freebie!